Nine of the 10 Mexican wolves living at Brookfield Zoo will depart for new homes this month as part of a survival plan to help sustain the endangered species, the zoo announced this week. The zoo’s current alpha pair, Zana and Flint, will move to a facility in Eureka, Missouri, along with a young female named Springer. Six male wolves – Rio, Azul, Mateo, Jeff, David and Temp – will head to a zoo in Springfield, Missouri. Two-year-old Ela will remain at Brookfield Zoo and become the new alpha female, with a new alpha male scheduled to arrive before the end of the year. Ela and the new male will become the zoo’s new breeding pair. Two young female Mexican wolves will also join the zoo before the end of the year. The two wolves will participate in a reproductive hormone monitoring study during the upcoming breeding season before being placed in new, permanent homes next fall. 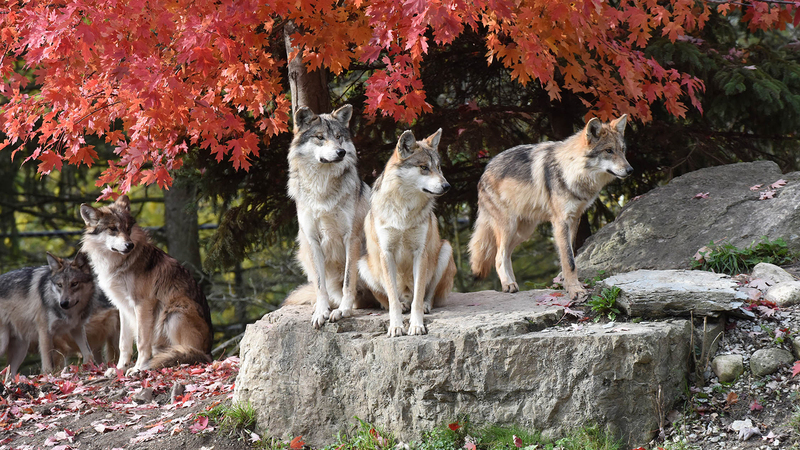 Saturday will be the last time visitors can see the zoo’s current 10-wolf pack together. For a last hurrah, zoo staff will give the wolves a deer carcass to enjoy at 11:30 a.m. Saturday, the zoo said. The group is one of the largest and most successful packs within the the U.S. Fish and Wildlife Service’s nationwide Mexican Wolf Recovery Program, according to the zoo. The pack’s young wolves are now in need of new homes as they mature, given that young wolves normally disperse from their natal pack at 2-3 years of age, the zoo said. Since 2003, CZS has collaborated with USFWS on its recovery program for the species, facilitating cross-fosterings of puppies born at the zoo and releasing one adult female into the wild who subsequently had her own litter of pups. Mexican wolves were once common in the southwestern U.S. but were nearly wiped out in the mid-1970s, with fewer than 10 remaining at one point. Starting in 1998, 11 Mexican wolves were reintroduced to the wild in Arizona after being bred in captivity. Although their numbers have grown, there are still only 281 individuals in captivity, and another 144 in the wild, making Mexican wolves the most endangered subspecies of wolf in the world, according to USFWS. The species is considered an apex predator, or a predator at the top of a food chain upon which no other creatures prey, and the presence of Mexican wolves is vital for maintaining a healthy ecosystem in the southwestern U.S., experts say.